Thanks for these questions, Laz–and the opportunity to learn from this exercise. These are multiple devices per site, each utilizing the same static IP scheme–changing it is not practical. Each device does not and should not communicate with any other, but I need to access each client on each device in order to scan them. The scanner will run on a server, to be installed at each site. The WAN provider has given me 200 addresses for each site, and those are the addresses I will use to reach each client. I intend to subnet those 200 addresses into seven /27 networks, enough for six devices and a few addresses left over for management. The static IPs on the devices are contiguous (.1-.25) within the local 192.168.115.0/24 address space. 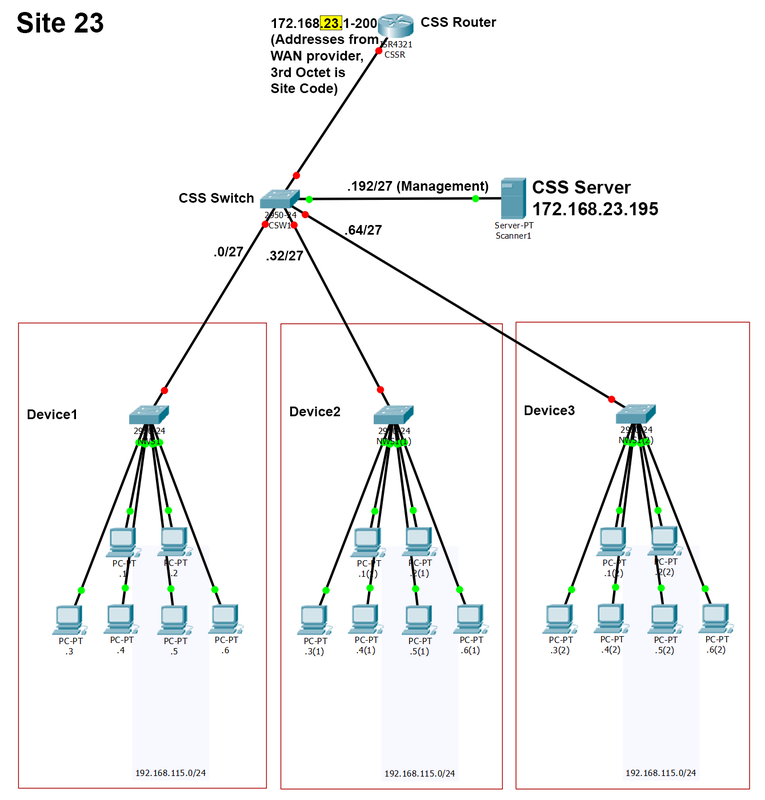 The problem I am trying to solve is to transcend the “public” IPs and reach the local IPs remotely. Is this possible with NAT? If so, can it be done on the router in the diagram? Or do I need additional L3 devices between the switches? The scanner will run on a server to be installed at each site. Will this scanner have an internal IP address of the form 192.168.115.X? The 200 addresses, are those routable? i.e. not private? You say that the WAN provider has given you 200 address for each site. That’s 200 for each site? Where is the central device from which you want to access all of the internal clients? What is it’s IP address? What role do the servers at each site play? not sure I understood that part. At first glance, what you will require is some nat translation with port forwarding so that you can access each individual client, but I must more fully understand the network topology before i can answer. My preference would be to keep the scanner off the 192.168.115.x network, but instead route its 172 address to all the clients on site. Yes, I have 200 addresses at each site and can route to them from a central server at a different site (ie. 172.168.22.195), for the purpose of initiating and collecting the scans at all of the other sites. Ideally, I want a one-to-one translation between the local 192.168.115.1-30 to a 172.168.23.1-30 public address. Then repeat that scheme for the next one on site–192.168.115.1-30 can be reached from the outside by 172.168.23.33-62, and so on. Is NAT right for me? Sorry for the late response. If you have a one to one relationship between the internal and external IP addresses for the clients, then yes, NAT would work for what you want to do. Sounds like an interesting setup, let us know how it goes! Using a route map to define a static NAT is helpful because it adds a lot of flexibility. You can easily adjust which addresses are allowed and which are not. This is especially the case for one to one static NAT like the one you show in your post where users from the Internet (or from the outside network) can directly access the device on the inside via this static NAT translation. By adding the route-map and placing entries in the associated access list, you are blocking incoming requests from the specific IPs that are listed there. You can limit and filter who has access from the outside to the device you are translating to. This is typical good practice especially when this is something that you want to adjust over the days and months of its operation. I am having problems with the PAT so I came to this one to back track and so I had just copied the configs from the config tabs. that is why its not working for people!!! Ok I have tested this one and it works…. minus the changes that need to be made that I posted above. I also did no ip routing on the Web server… before I did that I could not ping from host to web but after I did that I could… odd! Thanks for catching that, I’ll let Rene know! Translates the source IP address of packets that travel from inside to outside. Translates the destination IP address of packets that travel from outside to inside. Translates the source IP address of packets that travel from outside to inside. Translates the destination IP address of packets that travel from inside to outside. So in your first example: source IP address 192.168.12.1 is translated to 192.168.23.2 when it translates from inside to outside. Destination IP address 192.168.23.2 is translated to 192.168.12.1 when the packet travels from outside to inside. In the second example, we translate source IP address 192.168.23.2 to 192.168.12.1 when the packet travels from the outside to the inside. We translate destination IP address 192.168.12.1 to 192.168.23.2 when the return packet travels from the inside to the outside.